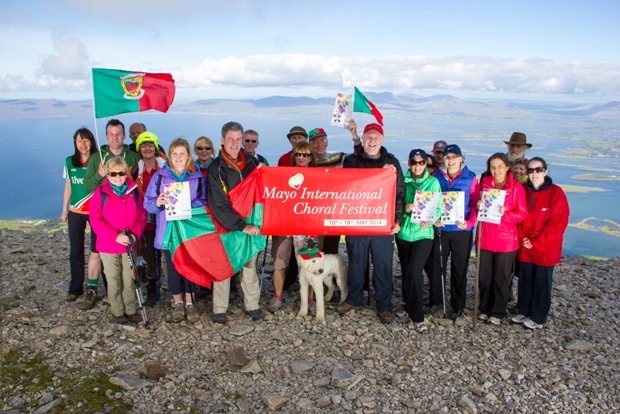 Last Saturday (14 Sep) saw the Mayo International Choral Festival reach new heights as the 2014 syllabus was officially launched from the top of Croagh Patrick, one of Ireland's most well-known landmarks! Representatives from several Mayo choirs became musical mountaineers for the day and hit all the high notes in a rousing chorus of ‘Moonlight in Mayo' 2507 ft above sea level! A prominent landmark was indeed required as this festival is rapidly becoming one of Ireland's most prominent festivals! 44 choirs participated in 2013 with some describing the festival as a now ‘firm favourite' amongst their choir members. Next year's festival promises to be even more exciting with several national and international choirs already booked into Mayo hotels. Great credit must be given to the choral climbers representing Castlebar Parish Choir, Cill Aodáin Choral Society, Cór Mhaigh Eo, Mayo Male Voice Choir, the Moy Singers and Westport Choral Society. A terrific day was had by all followed by a well-deserved celebration at base-camp - Campbells's Pub. Said Chairman Edward Horkan; "We're delighted at the way the festival is progressing with choirs from the USA, England, Scotland and Ireland already booked into Mayo accommodation for 2014. There are already enquires in for the next four years. It was encouraging to see so many climbers today and particularly members of the Mayo choirs who have been so supportive since the start of the festival. We've definitely taken our festival to a whole new level today!"